'Miles Around Cottage' enjoys a peaceful and quiet location. There is no Wifi. Stunning panoramic views over the Derwent Valley and a peaceful setting on a non working farm, make this beautiful, tastefully furnished stone cottage for 2 an ideal base for enjoying the Peak District and it's many attractions. 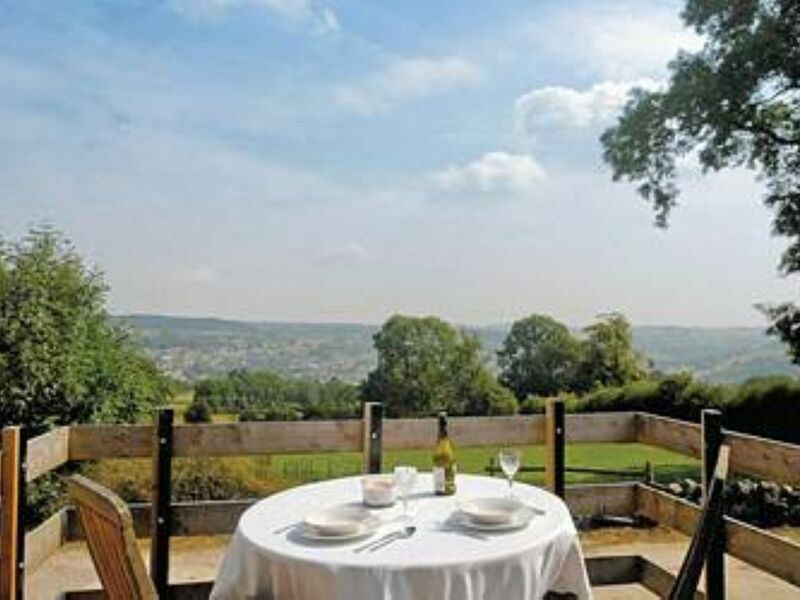 Superb rambles from the doorstep - the Limestone Way passes through the farm and the summit of the Heights of Abraham cable car and Great Masson Cave are only a short walk - yet Matlock's many pub's, restaurants and shops are just a mile away. Bathroom with toilet, bath and shower over bath. Kitchen, dining and living room all open plan. Kitchen with electric ceramic hob cooker, fridge with ice box, microwave, toaster, kettle, iron and ironing board and all necessary crockery, cutlery, glassware and cooking utensils. Complete with table and 2 chairs. Notes on accommodation: Sorry no pets and non smoking. Outside: Private balcony terrace with furniture. All linen, towels (incl. tea towels) and heating are included. There is no wifi at Miles Around Cottage. Lovely cottage very welcoming host. Magnificent views and plenty to do. A wonderful stay in fantastic location. Although we stayed during November and December, this larger than expected cottage was snug, warm and very comfortable. The views from the cottage are truly stunning across the Derwent Valley to the town and the walks straight from the front door are many and varied. There is lots to do around the area, but if you want to just park and forget the car and walk and can cope with the odd hill or few, then this is an ideal place to stay with plentiful excellent eating and drinking within good walking distance. The owners are as friendly and helpful as you could possibly want and we had a lovely stay. Lovely quiet cottage, nicely decorated and furnished and well equipped. The owners were very friendly but did not intrude on our stay in this lovely peaceful place. Sadly the weather turned cold for our week so we were unable to use the terrace from where there are lovely views across the valley, but there is a very good central heating system. Ideal for a break away from it all and a chance to recharge our batteries. Our only complaint would be that for us the bed was a little soft, but obviously that is just a personal preference. We would love to return sometime. We had a very relaxing week at Miles Around Cottage which lives up to it's name with wonderful views, perfect to sit out on the thoughtfully placed table and chairs sipping a glass of wine. Lots to see and do nearby. We enjoyed the Tram Museum which offered rides on the trams. Also, of course Blenheim Palace is a must but you need a whole day to explore it. The scenery in the Peaks is glorious. It's a place that will stay in our memories for ever. Once famed for its hydros and spa treatments, Matlock is now a bustling town surrounded by the spectacular countryside of the Derbyshire Dales. Overlooked by the imposing Smedleys Hydro (now the offices of Derbyshire County Council) and Riber Castle, the town owes much its status to John Smedley who built both these grand edifices, plus several more. The River Derwent and the A6 road both run through the middle of the town, which centres on Crown Square. Matlock boasts an award-winning park - Hall Leys Park, complete with boating lake, riverside paths, tennis courts and skateboard park. It is the first of five beautifully restored public parks stretching along the River Derwent to Matlock Bath. The hillsides around afford some superb viewpoints and superb countryside is literally on the doorstep. With a good range of shops and restaurants plus excellent bus and rail links (on the Derwent Valley train line from Derby) this is an ideal base for exploring the area. Peak Rail runs heritage steam and diesel trains from Matlock station and there is a superb new Leisure Centre on the edge of the town. Don't miss the magical Matlock Bath Illuminations which take place a little further along the river at weekends during September and October. Booking Notes: A deposit of £100 is required for each stay or week booked. Payment can be made via bank transfer or cheque. On receipt of the deposit your holiday will be booked. The balance payment is due 6 weeks before your arrival date. If booking from outside the UK, paypal can be used but the standard paypal charges will apply. Changeover Day: Saturday changeover for week bookings. Short breaks, Friday and Monday changeover is preferred with departure by 10.00am and arrival from 3pm (to allow for cleaning, linen change etc). However please ask as there may be some flexibility depending on other bookings. Notes on prices: Week bookings are from Saturday to Saturday. 3 night weekend stays run from Fri-Mon and 4 night mid-week stays run from Mon-Fri. If availability allows we will consider stays of 2 nights.